In those distant days when I was a fairly serious athlete, we did not think much about style. Emil Zatopek’s three gold medals in Helsinki a few years previously had suggested that training mattered far more than style. The ungainly tension in his neck and shoulders was an irrelevancy. We were much more interested in the word-of-mouth rumours of his prodigious training sessions. At the time, we debated the merits of Percy Cerutty’s advocacy of running up sand-hills in contrast to Arthur Lydiard’s advocacy of 100+ miles per week. Neither style nor injuries were a major preoccupation. In contrast, during the past decade, running style has become a focus of attention among elite and recreational athletes. The focus of the elites is illustrated by Alberto Salazar’s efforts to improve Mo Farah’s efficiency prior to his attempt at the London marathon this year. But perhaps even more importantly, style has been a focus of attention of recreational runners concerned about repeated injury. A decade ago, distance running had blossomed into a mass participation sport and injuries were rife. Marketing of running shoes had become a major commercial enterprise. The running world was primed to embrace the idea that running no longer came naturally to modern man. Was it a consequence of wearing shoes all day or sitting for hours at a desk? Maybe even it was the training shoes that large commercial companies encouraged us to buy. The time was ripe for the emergence of gurus with messages about how to run naturally. Techniques such as Pose and Chi became popular. These techniques were embraced with almost religious fervour and many of the disciples found relief from their recurrent injuries. Unfortunately other novices came away from their flirtation with these techniques with new injuries, especially problems with the Achilles tendon. Now, a decade or so later, the reasons for these contrasting experiences are fairly easy to identify. Although a few important issues about running style remain unresolved, the decade of experience and of research has provide fairly clear answers to the major questions. Natural running: forefoot or heel strike? One of the most hotly debated issues has been the question of heel striking versus fore foot striking. In part, this debate arose from an idealistic quest to identify mankind’s natural running style, unsullied by the influence of modern life styles. I will focus predominantly on Pose because its strengths and weaknesses are fairly well documented in books, research papers and on the Pose Tech website. The second chapter of ‘Pose Method of Running’ (Pose Tech Corp, 2002) opens with an examination of images of runners on classical Greek pottery. 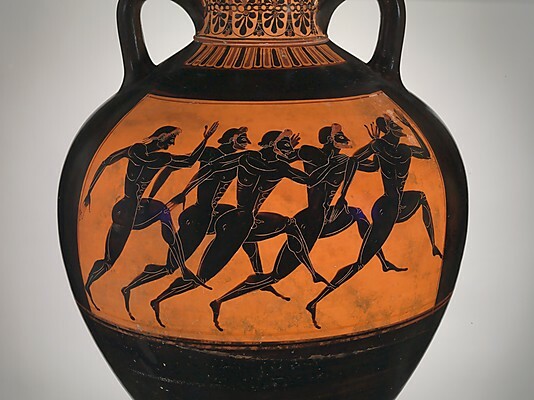 One of the images is from an amphora depicting runners at the panthenaic games in 530 BC. The inventor of Pose, Nicholas Romanov writes: ‘Look at these drawings and you will see quite clearly that all the athletes run on the front part of the foot without landing on the heel. As barefoot runners this was the obvious technique for efficiency and to avoid injury. To my mind this barefoot running style of landing on the forefoot is the purest example of the proper nature of running….As the Golden Age of Greece passed mankind appeared to leave these values far behind’. The appeal to a golden age of classical Greece subsequently received some support from rigorous science. Based on evidence that our distant ancestors living on the African Savanah around 2 million years ago were probably persistence hunters who relied on the their capacity to chase their prey to exhaustion, Daniel Lieberman and colleagues at Harvard University examined the foot strike pattern of barefoot runners in comparison with runners wearing modern running shoes. He found that barefoot runners tended to land on the forefoot or midfoot whereas runners wearing shoes tended to be heel strikers. The heel strikers experienced a more rapid rise in the loading of the legs in early stance, although Lieberman was careful to avoid claiming at that stage that fore-foot striking would result in a lower injury rate. Further investigation casts some doubt on the conclusion that habitual barefoot runners are not heel strikers. A study of habitual barefoot runners from north Kenya by Hatala and colleagues did provide further evidence that forefoot strike reduces the magnitude of impact loading. However, these habitually barefoot Kenyan runners tended to land on midfoot or forefoot only when running at sprinting speed, where impact loading is high. The majority of them landed on the heel at endurance running speeds (5 m/sec or less). At their preferred endurance speed (average of 3.3 m/sec) 72% were heel strikers. Could it be that heel striking is actually more efficient at endurance paces? Is heel striking more efficient at endurance paces? Ogueta and colleagues from Spain compared efficiency in two well matched groups of sub-elite distance runners and found that heel strikers are more efficient than midfoot strikers, across a range of speeds. Heel strikers were 5.4%,, 9.3% and 5.0% more economical than mid-foot strikers at speeds of 11, 13 and 15 km/h respectively. The difference was statistically significant at 11 and 13 km/hr, but only showed a trend towards significance at 15 Km/hr. DiMichele and Merni from Italy, who tested runners only at a single speed of 14 Km/hour, found no significant difference in efficiency between sub-elite heel strikers and mid foot strikers. Overall, the evidence suggests that at paces typical of recreational endurance running, heel striking is more efficient but the advantage diminishes as pace increases. This is consistent with the observation that in most runners the point of contact at footfall moves forward along the sole of the foot as speed increases. These studies were cross sectional studies comparing different runners. Indirect evidence of the effect of a change to forefoot landing within an individual is provided by the longitudinal study by Dallam and colleagues of 8 athletes who changed to Pose. They found that 12 weeks after changing to Pose, the athletes were on average of 7.6 percent less efficient than before the change. Perhaps 12 weeks is not long enough to achieve facility with a new style, but the consistency of the magnitude of the penalty associated with forefoot/midfoot striking in the study by Ogueta and the penalty attributable to Pose in the study by Dallam adds weight to the conclusion that heel-striking is more efficient at endurance paces. With regard to risk of injury, the evidence is more complex. In a retrospective study of US collegiate distance runners, Daoud and colleagues found that habitually rear-foot strike had approximately twice the rate of repetitive stress injuries than individuals who habitually landed on the forefoot. Traumatic injury rates were not significantly different between the two groups. The sharp initial rise of ground reaction force observed with heel strikers is a likely factor in the risk of injures such as tibial stress fracture. It is noteworthy that during a session that included a total of approximately an hour of running at lactate threshold pace, Clansey and colleagues found that several kinematic variables, including rate of rise of ground reaction force in early stance, increased significantly, suggesting an increased risk of stress fracture with increasing fatigue. However, mid-foot and forefoot strike have their own risks, especially for the muscles and connective tissues acting at the ankle, as indicated by the Capetown study of Pose. Consistent with this, Almonroaeder and colleagues found a 15% greater load (averaged over stance) and an 11% greater rate of rise of tension in the Achilles tendon in mid-foot and forefoot strikers compared with heel-strikers. Should the push be conscious? One of the features that appears to account for some of the success of Pose in reducing injury rates among its dedicated disciples is the avoidance of a conscious push against the ground. In reality, force plate data clearly demonstrates that runners do push against the ground, with peak vertical forces often exceeding three times body weight. A study by Weyand and colleagues demonstrates that faster runners push harder against the ground. Many elite sprinters, including Usain Bolt, report that they do consciously push. However, my own speculation is that for recreational distance runners, a conscious push can be harmful if it encourages a delay on stance, and an associated increase in braking. Paradoxically, since the delay decreases airborne time, a lesser vertical push is required to maintain the airborne phase, but a greater horizontal push is required to overcome braking. Excessive horizontal push is potentially harmful, as we will discuss in the section on risks of braking, below. In the words of Romanov and Fletcher: ‘Runners do not push off the ground but fall forwards via a gravitational torque’. Pose theory draws on the observation that pivoting forwards is an effective way to initiate the action of running to explain how gravitational free energy can allegedly be harnessed even during running at a steady speed. The theory proposes that this can be achieved by employing the sequence of Pose, Fall, Pull, in the period from mid-stance to lift-off. Romanov’s description of the Pose does in fact match the balance posture of many good runners at mid-stance: knees and hips are slightly flexed while the hips and shoulders are aligned over the point of support through which force is transmitted from foot to ground. However, the Fall, which Romanov claims provides gravitational free energy, simply does not occur. The body’s mass rises rather than falls in the second half of stance. This is clearly predicted by computation based on the time course of ground reaction forces, and also clearly apparent from video clips. The Pose Tech website claims that Usain Bolt employs Pose style, yet examination of the stills from the video of Bolt winning the 100m World Championship in Berlin in 2009 depicted on the PoseTech site, indicates that his hips and torso rise about 7 cm between mid-stance and lift-off. The origin of Romanov’s erroneous concept of the fall is revealed in fig 7 from his paper published with Graham Fletcher in Sports Biomechanics in 2007. In that figure, the authors mistakenly assume that the vertical component of ground reaction force is equal to body weight whereas force plate data show that is several times body weight at mid-stance. I discussed this issue in greater detail in my post of 14 Feb 2010. And finally, it no is more possible to get airborne by pulling the foot towards the hips than it is to self-elevate by pulling on one’s boot straps. However, despite being based on fallacious theory, Pose does offer some benefits to at least some recreational runners. The discouragement of harmful excessive conscious pushing is balanced by focus on drills such as Change of Stance that help develop the neuromuscular coordination required to get off stance quickly. However, a greater vertical push would be required to maintain the longer airborne time if stance time were to be decreased at constant cadence. Pose technique averts this problem by encouraging increased cadence. For recreational runners who tend to spend too long on stance and to run with cadence that is too low, Pose can be helpful. However, short stance and high cadence each create their own problems. A rational approach to the challenge of identifying the optimum foot-strike , duration of stance and cadence for an individual runner under particular circumstances requires an understanding of the benefits and risk associated with the three major energy costs of running: overcoming braking while on stance; getting airborne; and repositioning the swinging leg during the airborne phase. It is clear that efficient running requires a trade-off between the three major energy costs of running: getting airborne, overcoming braking and repositioning the limbs. We can minimise the energy cost of braking by getting off stance quickly, but that creates a demand for greater energy expenditure to maintain a longer airborne phase, unless cadence is increased. However, as described in my post of April 2012, increased cadence demands more energy expenditure to reposition the swinging leg, so we need to find a compromise that minimses total cost. The optimum balance between the three costs depends on pace and other circumstances, such as level of fatigue. We also need to take account of the need to minimise injury. Getting airborne demands a strong push against the ground. It appears at first sight plausible that the stronger the push the greater the risk of injury. Surprisingly, studies that compare injury rates between individuals who differ in the magnitude of the vertical push they exert against the ground do not consistently find a significant association with injury rate. This might well be because the strength that allows faster runners to push more strongly also helps protect them against injury. Thus comparison between different runners might obscure a relationship between intensity of push and injury risk for an individual. Some studies, reviewed by Zadpoor, do demonstrate an association between rate of rise of the vertical forces and risk of injures such as tibial stress fracture. Rate of rise of force is related to both duration over which the force rises to a peak (determined largely by the type of foot-strike, with heel striking creating a steeper rise), and also by the magnitude of the average force (which is inversely proportional to the fraction of the gait cycle spent on stance). Thus it is likely that at high speeds a strong push combined with mid or forefoot landing produces optimum efficiency and safety, though forefoot landing is only safe if the Achilles is well enough conditioned to take the strain. For most runners it is probably safer to ensure that at least some of the load is taken on the heel in longer races. At slower speeds, efficiency is greater with heel striking, and the risk of injury depends on whether the individual is more prone to adverse effects of stress at the knee or the ankle. Stress on the knee is greater with heel-strike, but greater at the ankle with forefoot strike, as demonstrated in the Capetown study of Pose. Braking generates both compression forces and shear forces at joints, and also increases stress on hip extensors which must overcome the excessive hip flexion associated with the forward angle of the leg at foot-strike. One possible consequence is pain at the point of attachment of the hamstrings to the pelvis. Therefore from the injury perspective excessive braking must be avoided but it is necessary to bear in mind that there is a trade off between the low braking costs of short time on stance and the costs of being airborne for a greater propotion of the gait cycle. If excessive braking is to be avoided, it is crucial to avoid reaching forwards with the swinging leg, and ensure that the foot lands only a short distance in front of the centre of mass. The jarring associated with braking can be reduced by ensuring that the knee is flexed slightly more than the hip at foot-strike, but the penalty is a loss of rigidity of the leg which might reduce the efficiency of the capture of elastic energy. As discussed above there is a trade-off between braking and getting airborne. Excessive braking demands excessive horizontal push after mid-stance, and an inevitable increase in total stance time. For a runner prone to spend too long on stance focus on a precise push off, governed by conscious down-swing of the opposite arm can promote a good balance between the cost of braking and the costs of getting airborne. The third element, leg repositioning cost, increases with increasing cadence, but conversely, the energy cost of getting airborne decreases with increasing cadence. The stresses on the tissues of the body associated with getting airborne, and therefore, the likely risk of injury, decrease with increasing cadence. Therefore, many runners, both recreational runners and even some elites, including Mo Farah, might benefit from increasing their cadence, but not so far that the increased energy cost of repositioning become excessive. The optimum cadence depends on various circumstances. Based on observation of elite runners and the calculations presented in my blog posts in Feb and March 2012 suggest that optimum cadence is at least 180 steps/min at 4 m/sec, and 200 steps/min at 5.5 m/sec. However the precise optimum for each individual will depend on leg strength and elasticity. For runners with lesser power and elasticity it is probably best to employ higher cadence, thereby reducing the need for vertical push. As my leg muscle power and elasticity have deteriorated with age, I have been forced to increase cadence. Typically my cadence is around 200 even at a pace of 4 m/sec. This involuntary increase in cadence has helped minimise the risk of damage to my elderly legs, at the price of inefficient expenditure of energy on repositioning my swinging leg. I am therefore working on increasing power and elasticity so that I can push off more powerfully and thereby decrease cadence safely. Perhaps the most serious error promulgated by gurus is the claim that there is a single best style that is most efficient and safest. The evidence regarding the greater efficiency of heel-striking at endurance paces, yet greater risk of at least some repetitive strain injuries with heel strike illustrates the fallacy of this claim. The most efficient foot strike pattern, time on stance and cadence vary with pace, and in addition, the risk of injury depends on factors that vary between individuals, such as strength of muscles, tendons, ligament and bones. Perhaps the most important strategy of all for minimising injury is building-up of training load slowly over time, and being aware of the effects of fatigue on form during demanding sessions. Running style does play a crucial role but a much more nuanced approach based on an understanding of the costs and benefits of each aspect of form must be taken to identify what is best for each individual in their current circumstances. The debate and the scientific studies of the past decade have indeed provided us with much information to make these nuanced judgments. This entry was posted on February 17, 2014 at 3:18 pm and is filed under Running Mechanics. You can follow any responses to this entry through the RSS 2.0 feed. You can leave a response, or trackback from your own site. It is my understanding that Romanov did claim that the motive force for running is derived from falling forward, though later he said this was a misunderstanding based on a poor translation. Where are all the machines/cars and so on with a large falling object providing “free” energy! As to Pose, even those trained by him personally have an exceedingly high injury risk in the following months. Having said that, if you are a natural forefoot striker, lucky you! Thanks for your comment. With regard to whether or not Nicholas Romanov ever actually believed gravity provides the motive power for running, his many different descriptions of falling forwards after midstance, together with both the title and figure 7 of Romanov & Fletcher, ‘Runners do not push off the ground but fall forwards via a gravitational torque’ (Sports Biomechanics, volume 6, pp 434-452, 2007) leave little doubt that he did believe that runners fall forward after midstance and then pull the foot towards the hips. The erroneous figure 7 shows the forces acting on the body after midstance. Due his mistaken assumption that the vertical ground reaction force is equal to body weight (whereas in fact is is typically several times body weight) he concludes that the resultant force is directed forwards and downwards, producing a fall, whereas in fact the resultant force is directed forwards and upwards, causing the body to rise. There is no fall after midstance. I have attempted to discuss this with him personally but he simply responded, in fluent English coloured by a charming Russian accent, that he was the expert. However, I believe that the illusion created by his mistaken understanding of biomechanics is actually one of the most helpful features of Pose, at least for those recreational runners who try too hard to push and consequently spend too long on stance. But I also believe that there are many runners for whom Pose is not useful. Nonetheless, I consider that my attempts to understand why Pose works for some runners despite the faulty theory has helped me develop a better understanding of running technique. I can’t help but feel the Ogueta study is flawed, for a % efficiency differences to change so rapidly over such a small range of speeds doesn’t sound plausible. As one with mid-foot strike by running 2km/h faster, from 11 to 13, am I really becoming 4% less efficient? But then speeding up from 13 to 15 I would then magically become 4% more efficient? What could the forefoot runners be doing at 13km/h to be nearly 10% less efficient than rear-foot runners? Are they flailing their arms around? Carrying 10% extra load on their back? How on earth could they be using that much extra muscle power to do the same amount of work? Also one usually relates shorter time on stance with low breaking costs and lower energy consumption, especially with the same cadence as this study suggested the forefoot and rear-foot runners had largely the same cadence. Yet this study suggests that longer time on stance can make you more efficient despite the extra breaking costs? What about elastic recoil? Your previous discussion on the topic of running form you suggested with longer time on stance, less energy returned from elastic recoil. One would also expect a forefoot runner to benefit more from elastic recoil so might gain some efficiency here benefiting shorter time on stance. Putting this all together I really am stuck to come up with an explanation of how a heel strike could be more efficient, let alone nearly 10% more efficient? What could a heel striker being doing so much better than a non heel striker? From a personal level 13 km/h is around about my current marathon pace. Times when I do experiment with heel strike I have activate my shin muscles to dorsiflex my ankle that would otherwise be landing relaxed. This movement pattern doesn’t feel relaxed or natural to me these days, it certainly doesn’t feel more efficient. Even if I practice to become a heel striker once more and could relax more, I’d still have to activate my shin muscles prior and on landing, and then push off more with my calves towards toe off to rebalance the breaking forces. Despite these extra costs I’d find saving of less muscle activation elsewhere in my body that would be able to provide these benefits. Obviously if I could find an extra 9.3% efficiency it’d be great – if I could then I’d bag myself a 18 minute PB, all from just learning to be a heel striker…. Um…. I smell a big pile of doo doo when it comes to the plausibility of the Ogueta study. Thanks for your comments. The variation in effect size between the three different paces in the Ogueta study provides no reason to be concerned because much of it is accounted for by random variation. Ogueta did not present a statistical test of the differences between the different speeds, because that was not the question addressed in that study; the question was whether the differences were greater than zero. They did report that the 5.0% difference at 15 Km was not significanlty different from zero (as stated in my post) so the difference between 5.4% at 11km/hr and 9.3% and 13 km/hr was unlikely to be significant. However each of these values was significantly different from zero. Because of the variability of findings in biological measurements, one isolated study would not provide compelling evidence. However, as I noted the findings of Ogueta are consistent with the finding of the Dallam study and with the di Michele study. There are several other studies, most of which find either that heel-strike is more efficient or there is no significant difference in efficiency between fore foot and heel strike. A study by Gruber compared rear foot (RF) with fore foot (FF) strikers when using their habitual style and when using the other style. http://jap.physiology.org/content/early/2013/05/13/japplphysiol.01437.2012.short At slower speed RF was more efficient that FF for habitual RF, but not significantly more efficient for habitual forefoot strikers. At faster speed (4 m/sec ) RF was more efficient than FF under both habitual and non-habitual conditions. Overall, in three of the four tests RF was significanlty more efficient than FF, while in no condition was FF more efficient than RF. Also of interest, at slow speeds, use carbohydrate was more efficient with heel strike – a matter of importance at marathon and ultra-marathon distances. Overall, despite differences in magnitude of effects between studies, the evidence that heel strike is more efficient is quite strong. The question of whether this benefit disappears at high speed is less clear, though the observation that more runners land on the forefoot at high speed does provide indirect evidence that FF landing allows a stronger push and therefore facilitates faster running. The mechanism of the benefit of heel strike is not so straightforward. Several studies report longer time on stance with heel strike, and therefore braking costs will be greater. However, there is a trade-off between braking costs and the cost of getting airborne. At very low speeds, braking costs for a given time on stance are relatively small because the body moves a small horizontal distance during stance and the obliquity of the leg is less. Therefore, I am not surprised that the longer time on stance and lesser airborne time associated with heel striking is more efficient at very low speed. I am a little surprised that the data indicate that heel strike is more efficient at medium speeds. Maybe the capture of elastic energy by iliopsoas is more efficient with heel striking. In general, I would expect the large muscles acting at the hip to make a bigger contribution to the energy consumption of running, and therefore offer greater scope for saving via elastic recoil. The problems with the Ogueta study really have to preclude from using it for any generalizations about running form, the data simply isn’t credible or consistent enough with other data. The Gruber study only finds the rearfoot pattern more efficient than forefoot when a habitual rearfoot pattern runner attempts to run with a forefoot pattern. This is absolutely not the same as evidence that rearfoot is generally more efficient than forefoot, it’s only proof that ones habitual strike is more efficient than an unfamiliar one. However, the Gruber study didn’t find this efficiency loss when a habitual forefoot pattern runner used a heel strike. Why this might happen is curious. Why are this group of runners more gait flexible? Is it that we humans spend a lot of time walking so can practice heel strike? Do forefoot runners spend some of their time landing on heel at least at some points whilst out running? Could the forefoot strikers have been heel strikers in the past? I can’t help but feel that you are latching on to conclusions that the data doesn’t really sustain. This study found improvements in running economy, this underlines the weakness of making any conclusions about RF pattern runners changing to FF pattern in the Gruber. It shows that you have have a period of adaptation to see any real performance improvements/reductions, you simply can’t make conclusions from short term changes. Given all of these problems with taking conclusions from limited studies, I really do think ones only safe conclusion would be that there is no compelling evidence that either landing pattern is optimal. One thing not considered that all mix things up is the type of footwear required. I now have a habitual mid-foot strike and can quite happily run 40 miles in lightweight, minimally cushioned shoes that heel striker is unlikely to be able to accommodate. You can get lightweight shoes suitable for heel striking, but generally the more cushioning and motion control “technology” that is placed in shoe the heavier it gets. Weight of the shoe is an important factor in efficiency. You have not identified any problems with the Ogueta data. As discussed in my previous comment the variability between magnitude of the effects at different speeds is completely consistent with that expected from variation between individuals. Ogueta’s findings are consistent with most other studies, to the extent that would been expected allowing for known between-subject variability. The Gruber study alone does not provide unequivocal evidence, but the balance of the evidence does support RF. RF was superior even in non-habitual RF strikers at high speed, though I myself was surprised by this. Because there is a bias against non-habitual style, that fact that at faster speed, non-habitual RF was more efficient that habitual FF is a striking finding in favour of RF. I accept that there is variability between studies but despite this there is remarkable little evidence that FF is more efficient, yet there is substantial evidence that RF is more efficient. Thus the balance of evidence favours RF, though as I stated before, in general the evidence indicates that the advantage of RF is less at higher speeds, apart from the striking evidence in favour of RF at higher speed provided by Gruber. I agree that weight of shoe is an important factor, but as the Hatala study showed, 72% of a sample of habitual barefoot runners from north Kenya adopted rear foot strike at their self-selected endurance pace, suggesting that at endurance paces, RF is preferable even for barefoot runners. It appears that light weight shoes and midfoot running suit you well. I too mainly land on forefoot or midfoot, and often run in light weight shoes. I accept that there is substantial variation between individuals; indeed one of the points of my blog is that it is neessary to take account of variation between individuals. The recently popular assumption that FF or even mid-foot is best for the majority of runners at endurance paces is not supported by the balance of evidence. The Ogueta data is clearly unrepresentative. You simply can’t change efficiency in anything like the scales that data has. With You simply can’t apply data that you acknowledge has been heavily affected by individual variability and generalize it. The Ogueta isn’t consistent with other studies, the Gruber data doesn’t support it at all and finds no advantage for habitual RF vs FF. The study in gait retraining and efficiency I highlighted contradicts the Oguata data. If a finding surprises you then look deeper into what might be causing the unexpected result. The Ogueta data doesn’t fit with what we might expect from a mechanical standpoint, nor does it fit with other studies, the magnitudes differences between RF and FF are implausible. Perhaps the Oguete study just isn’t representation and is unhelpful with making any general conclusions?? As for balance of evidence… Perhaps balance of cherry picked evidence that is mis-interpreted. The Ogueta study does not contradict Gruber. Gruber does find an advantage for RF over FF for both habitual and non-habitual RF runners at higher speeds, while Ogueta finds a similar trend for habitual RF over habitual FF/mid Foot at a similar speed. It is noteworthy that the trend for advantage of RF found by Ogueta at higher speed is in fact quite a strong trend. Furthermore, Gruber’s finding of lack of significant advantage for RF in non-habitual RF runners at low speeds does not contradict Ogueta’s finding of an advantage for habitual RF compared with habitual FF or mid-foot. Overall, the evidence indicates that there is substantial variation between individuals but the balance of evidence suggests that on average RF is more efficient. I have been careful not to cherry pick the evidence, but have attempted to weigh-up all the available evidence. Statistically significant effects reported by Ogueta, Gruber and Dallam all favour RF. They each address the question in a somewhat different manner. However there are no contradictions between them. Di Michele finds virtual zero difference between energy costs of RF and non-RF at a moderately high speed. The evidence that gait training improves efficiency which you quoted from Pete Larson does not contradict Ogueta. It does emphasise that the lack of significant advantage of non-habitual RF over habitual FF at low speed in the Gruber study is likely to be accounted for by habit. It makes the Gruber finding of advantage of non- habitual RF over habitual FF at high speed even more striking. Even I am a little surprised by the strength of this effect. However, when there is a real effect, random variation sometimes inflates the effect while in other instances random variation obscures the effect. That is why it is necessary to weigh up all of the evidence. With regard to what might be predicted on the basis of biomechanical principles, your argument based on increased braking due to longer time on stance with RF fails to take account of the fact that there will be a saving from less airborne time. My own expectation is that at low speed the penalty from braking is less than the gain from reduced elevation costs. At high speed this balance will change, but the question of the speed at which this change occurs is likely to depend on individual factors related to variation in elastic recoil. As for the energy consumed by foot dorsiflexion or plantar flexion, I think you might be underestimating the work done in tensing gastrocnemius and soleus, but in any case, I think the work done by the large muscles acting at the hip makes a greater contribution to total energy costs. I only have access to the abstracts for each of the studies, perhaps you have access to the full study, but for my there is something rather odd about the Ogueta data, not just the 5% base line difference but the peak to 9.3% efficiency difference. Think about what that actually means in practice, for this to be representative running at marathon pace I’d have to have a 8bpm difference in heart rate between heel strike and mid-foot. That’s a huge difference, it’s the difference between mean running at a easy pace and moderate pace, or moderate pace and lactate threshold. For sure I’d know about. Yesterday I did a 8 miler at marathon pace, just under 13km/hr, and briefly experimented with heel strike vs mid-foot and could notice any change in HR or breathing. Today I did 6 miler at recovery pace, just under 10km/hr, and again experimented with foot strike but again couldn’t spot any difference. Heel strike sure feels more awkward, but feeling more relaxed with a mid-foot strike but from this experiment on one I have to conclude for me there is little difference between a mild heel strike and mid-foot strike. For me to make a mid-foot strike 9.3% less efficient I’d have to be flailing my arms around, weaving, bobbing doing about everything I could to waste energy. A couple of % difference I could possible but still not something I exhibit myself, but the magnitude of difference is Ogueta study just isn’t credible. As for the difference getting bigger at higher speed, well the Ogeuta study doesn’t show this – it gets worse then better, and you suggest the Gruber does but having read just the abstract there is only the last sentence that suggest this, and it’s not at all clear that whether it applies just to the rear-foot strikers attempting mid-foot, or applying to the mid-foot strikers as well. Previous sentences suggest that there is no efficiency difference between RF and MF, for your interpretation to be correct the abstract would have to be contradicting itself. The effects of running surface may well be factor in these studies. The Ogeuta and Gruber studies were on a treadmill. Th DiMichele and Merni study was on outdoor track. To quote this study “Conversely, there was no significant difference (p>0.05) between the groups with respect to mean oxygen uptake (midfoot strikers: 48.4mlmin-1kg-1 (SD=5.3); rearfoot strikers: 49.8mlmin-1kg-1 (SD=6.4)). ” which has the MF runners 2.9% more efficient, not statistically significant, but it contradicts the Ogeuta study and your interpretation of the Gruber. Personally I run outside, exposed to the wind, not on a treadmill. If you are going to do a study on efficiency I’d do it outside for accuracy not convenience. This statement is intriguing. Increasing contact could make one more efficient. All the suggestions of Pose and other teachings that stress how wasting energy to breaking forces are barking up the wrong tree. It would suggest the benefits of longer contacts times, and with it lower peak forces are more beneficial that shorter contact times. As described in my previous comments, the observed difference between RF and FF efficiency is a combination of the true mean difference for the relevant population and a contribution from random variation between individuals. If the between subject variation within a group is random, it is equally likely to give observed values above and below the population mean. It is probable that the observed value of 9.3 at 13 Km/Hr is inflated by random variation while the observed value of 5.4 at 11 Km/hr might be diminished by random variation. However we cannot tell for certain, and hence, need to take account of the data from all relevant studies. Overall, I consider it is quite unlikely that the true mean difference for the relevant population sampled in these studies (i.e. youngish athletes) is as large as 9.3%. On the other hand, examining all the evidence, a difference in the vicinity of 7% at low speeds is plausible. It is misleading to state that the non-significant penalty of 2.9 % for RF in the study by Di Michele and Merni contradicts my ‘interpretation’ of Gruber. It is a small effect in the opposite direction from the actual data in Gruber (averaged across habitual and non-habitual styles), prior to any interpretation. When an effect is of moderate size and there is substantial variation between individuals one would expect occasional measurements to show a small but insignificant effect in the opposite direction, just as other studies (maybe Gruber’s finding at higher speed, and Ogueta’s finding at 13 km/Hr) might exhbit an inflated effect. However the fact that the findings of Ogueta and of Gruber are statistically significant indicates that even if these effects were somewhat inflated by noise the true effect was nonetheless in the direction of an advantage for RF over FF/mid-foot. Nonetheless my expectation based on all of the evidence, both direct and indirect (eg Hatala et al) and biomechanical considerations, is that the benefit of RF will be small or absent at high speeds. Hence the small and non-significant finding of diMichele is consistent with the conclusions I drew in my blog: namely the balance of evidence suggests that at low speed RF is more efficient but this effect is reduced at higher speeds. The speed at which the difference becomes negligible will probably differ between samples but appears to be above 4 m/sec on average. Thanks for a most interesting dissection and summary of the style debate. I agree with your conclusions. The Hatala study of habitual barefoot northern Kenyans is most interesting — naturally heel-striking at speeds of around 5 mins per km or slower. Pose using the ancient Greek sprinters as examples is pretty funny. Even a slow jogger is going to get up onto their toes when sprinting. On the point of the energy cost of a strong push off the ground, isn’t ‘elastic recoil’ going to reduce this cost? As we run faster, we come down from the airborne phase from a higher height and thus produce more elastic recoil wouldn’t you say? Thanks for your comment. Yes, elastic recoil will decrease the energy cost of getting airborne, but even at high speeds, elastic recoil probably accounts for less than half of the cost. Elastic recoil plays a part in compensating for braking costs too. I suspect that the eccentric contraction of the hip flexors produced by the backward angle of the leg in late stance assists the subsequent hip flexion as the leg swings forward. I wonder whether this elastic recoil of the hip flexors is a major factor in the efficiency of heel-striking. The rapid rise of ground reaction force in early stance is followed by a relatively prolonged period on stance after the centre of mass passes over the point of support, thereby producing a pronounced backward angle of the leg at lift-off. The story of Lynn Jennings is thought provoking. The source of the pulmonary embolus is much more likely to have been a peripheral deep vein, than the right atrium. Endurance athletes have an increased risk of heart rhythm disturbance such as atrial fibrillation. However, transient atrial fibrillation is more likely to produce a clot in the left atrium than the right, and an embolus from the left atrium cannot reach the lungs. In general athletes have a low risk of DVT, though two risk factors to consider in athletes are haemo-concentration and air-travel. But on balance, I suspect that in Lynn Jennings’ case, her fitness played a larger role in her survival than in causing the problem. I wouldn’t expect significant differences in the efficiency of elastic recoil of the hip flexors of a heel strike vs mid-foot or forefoot striker. Having a jolt of force and energy to absorb is highly unlikely to be handled more efficiently by muscles and tendons than a smooth application force. Furthermore, for a heel striker to be more efficient overall due to elastic recoil of the hip flexors they would have to achieve a higher % efficiency in elastic recoil than they loose to extra breaking forces due to longer time and stance and the initial peak in loading. So it’s not just as efficient, but you’d need to be significantly more efficient, and if you really believe the Oguta data it’d have to give you a 9.3% improvement in efficiency, that’s a huge amount of efficiency to gain from one group of tendons and muscles, as breaking forces contribute only a portion of overall energy looses we’d easily be talking about a 20% gain in efficiency locally at the hip flexor. All from having a force provided as a jolt instead of smooth force application. My own experiences as one with habitual mid-foot strike I find my muscle tension affects how much “bounce” I have in my gait. If I’ve had a few fast runs my muscle tension goes up and I can feel a definite increase in the recoil I get from my whole kinematic chain, from my neck right down to my feet. In this tuned up state I’m more aware of how everything is connected and flexors in unison. A heel striker will certainly see the same affect when they tune up muscle tension by running faster, but I wouldn’t expect the whole kinematic chain to be used as a spring so efficiently as the foot, ankle and calves are out of sync with the loads being placed on them at footstrike. In fact the loads on the lower leg are opposite to what they should be if your want to absorb energy to be return by recoil. Above the knee kinematic chain can be utilized to absorb energy and return it after mid-stance, however it’s not matched to tension in lower leg, and there won’t be the same amount of energy stored as the lower legs ability to store energy won’t be fully utilized, you’ll end up more dependent upon the muscles and tendons above the knee to store and return energy. Given this I strongly doubt that a heel striker will benefit from better efficiency w.r.t elastic recoil. If heel strike is to be believe to more efficient than mid-foot or forefoot strike at some speed then we have to look elsewhere. Other reviews of these papers I saw one suggestion that muscle activation of the lower leg to absorb the forces might explain the extra energy used when using a mid-foot or forefoot strike. I don’t find this compelling though, as activating a muscles to slow it’s lengthening during eccentric load uses less energy than contracting and shortening a muscle. For a heel striker you are shortening and shin muscle and loosing all the energy put in to that muscle, while the soles and foot is activated but lengthened with a mid-foot strike with the potential for returning energy when the muscles shortens that to elastic recoil. Another suggestion, several reviews of the papers suggest this, is that simply increasing ground contact time and shorting time in air explains the difference. While not what I’d expect in terms of straight mechanical efficiency, and not what your own models predicated it may be worth looking at further. Could the key the peak loads being lower when you trade for time on the increase the ratio of ground contact time vs air time? Might we be able to generate these forces more efficiently when the loads are lower? Might out elastic recoil be more efficient when we are loading/unloading the muscles at a slower rate? Previously you’ve suggested the opposite to be likely, but sometimes speculation can be different than real world. If the ground contract time vs air time is the dominate factor in efficiency then could it be heel striking itself isn’t directly more efficient because it’s heel striking, but simply that it encourages longer ground contact time. One can easily adjust ground contract time when running in any foot strike so there is no reason why one couldn’t adjust ones gait more towards longer ground contact time vs air time. In fact as an ultra runner this is exactly what I’ve been working on over the last year or so. I haven’t done it for efficiency reasons, but because I won’t to generate lower peaks loads on my body, from the brain right down to the soles of my feet as the repetitive jarring itself is a major contributor to fatigue beyond energy exhaustion that efficiency might concern. However, I don’t really feel more efficient when adjusting my stride in this way. I notice that lower loads on my body, but I don’t “feel” that I benefit so much from elastic recoil. Another approach one could take is to not make the assumption that heel striking is more efficient at all, but there are weaknesses in the studies. The Ogueta study tested the runners who’s race pace at half marathon is 18km/h, but tested only at 11, 13 and 15, why not test at race pace and beyond? 11km/h is just 60% of their half marathon pace, equivilant to me running at 11 min/mile pace where I’m practically tripping over myself to keep myself running so slowly. They also limited the footwear weight to a non representative range (I train day/day out with 2oz lighter shoes then they were allowed). Also using just 20 subjects and not categorising foot strike fully (forefoot and mid-foot) and testing on a treadmill and not in the real-world. This all makes for plenty of weakness in the study and limits the validity of generalizes it. Gruber study was also flawed in that it was small number of participants, treadmill based, and had the runners run in a single shoe type (new balance rc 550) – a shoe type more appropriate for a heel striker than one with a mid-foot strike – personally I dislike to run in any shoe with more than 3mm heel drop, and have a preference for zero drop. Put me in a shoe with a 6mm or great heel drop and I feel awkward and inefficient. The shoe could very easily have given a bias towards heel strike. My suggestion that there might be increased elastic recoil with heel strike is not based on the jolt. It is based on the longer time on stance, together with the asymmetric time course of vGRF, thereby resulting in greater extension of the hip at lift off. With regard to Alison Gruber’s suggestion that it is due to excessive work done to maintain tension in soleus (which you mention), I think this is plausible but in general I favour an explanation involving larger muscles. With regard to the quality of the studies by Ogueta and Gruber, these studies are not appreciably better or worse than the other studies of this question. Ogueta did seek better matched samples than any other study. Gruber employed the interesting strategy of examining the same runners using both rear foot and non-rear foot styles. Use of a treadmill provides a much more accurate assessment of expired gases. The conclusions of these studies confirm Dallam, though you might consider that other aspects of Pose (eg encouraging short time on stance) account for the decreased efficiency after change to Pose. However it is also very clear that there is a wide variation between individuals. This makes it very unreliable to make general recommendation that apply to every-one, and it is especially unreliable to make recommendations based on one person’s experience. Asymmetry is very unlikely to improve the percentage efficiency of elastic recoil. In elastic systems you usual lower efficiency when asymmetry is introduced. Increasing time on stance may mean the range of angles and times are larger, but there is no reason to expect this to improve elastic recoil – with elastic system ones that are stiffer and have lower travel would normally be expected to better recoil performance. You also expect best elastic performance when the loading is applied and released smoothly. In previous posts and associated replies of yours, you’ve suggested that with muscle tissue elastic systems the amount of energy returned is time dependant so a slower return of energy will lead to higher losses. Given my familiarity with how elastic systems generally perform, and what I’ve learnt from your previous posts it really does seem rather unlikely that spending longer on stance will increase the efficiency of elastic recoil, the exact opposite seems far more likely. If longer time on stance is indeed more efficient at lower speeds then I believe a more promising area for an explanation is how efficiently we can produce the vertical load. With longer time stance vs time in air ratio the peak loads come down rather quickly, lower forces being generated by muscles makes it more likely that one can generate them using slow twitch fibres, and perhaps even reduce the number of fibres that need to be activated on each step. Another approach might be to look at the joint angles and how much the muscles shorten and stretch as well as the actual forces being applied through them. In the case of walking it’s around twice as efficient as running, so clearly we are able carry our weight more efficiently – through the leg bones that are more aligned so that muscle flexion and loading of the legs muscles is small compared to running. I’ve found my efficiency walking rapidly drops off when I try to walk much faster than 14min/mile pace. Also if I attempt to run very slow it also becomes less efficient, for me it seems that 10 min/mile is about as slow as I can run comfortable and efficiently. This means I have no mans lands of in-efficiency between 10 and 14 min/miles. Curiously my step length when running slow is shorter than my fast walking, achieving a high cadence when walking is really punishing but when running it’s easy to achieve it. Has this area been looked at in studies? The reason I propose greater elastic recoil with a greater time on stance is simply that longer time on stance will result in the leg being extended further back relative to the torso, thereby increasing the elastic recoil, just as pulling a bow string further back from the bow increases the elastic recoil. I consider that it is the greater extent of the stretch rather than any possible difference in rate of stretching that matters. The reason I mentioned asymmetry is that if wind resistance is ignored, the proportion of the area under the curve of GRF against time before mid-stance must equal that after mid-stance (to avoid a face plant). The early spike in GRF with heel strike is likely to be balanced by a longer ‘tail’ of the GRF curve. This longer tail accounts for the observed increase in time on stance and for the proposed increase in extension of the hip in late stance. Greater extension is highly unlikely to create greater elastic efficiency. Normally the greater the range of movement of an elastic system the more non-linear and greater the losses are. I don’t doubt that extra time on stance and will result in more energy being stored and released by the hip flexors, just like the bow example. However, this is only an advantage if hip flexors are some how more elastic efficient than other muscle/tension systems in the body. This is the key problem I have with your proposal, it’s wholly reliant on somehow the hip flexor can be used more efficiently, and not just a small amount more efficiently. If the Oguta study is anything near appropriate then you are looking for massive gains in elastic recoil efficiency from this one location. I don’t believe there is any reason to believe that hip flexors are more efficient than quads, hamstrings, glutes and calves and glutes at elastic recoil. The is also I can’t see why greater extension will result in greater efficiency in elastic recoil. Furthermore the amount of differences in extension and usage of the hip flexors between a runner with a heel strike vs mid-foot or forefoot strike will be small. This small difference is somehow multiplied in effect to give very significant increases in efficiency. I really can’t see how elastic recoil of the hip flexors could be plausible explanation of the differences seen in the Oguta study. I believe far more likely flaws in the study resulted in mis-leading data. I don’t have the paper, but the nature of the data is very odd. The testing of speeds that the runners would unlikely be train or racing at may well have led to poor results. For instance a 70min half marathoner’s recovery pace, the slowest pace they ever run at, is likely faster than the slowest pace tested. At an easy pace they’d be at the upper end of the speeds tested. Runners get efficient at the paces they habitually run at, so if some runners do lots of recovery runs while others use easy run, or faster paced runs then we’d see a significant difference in efficiency at very slow paces. I know because for a long while my efficiency at 10min/mile pace used be appalling, I’d only get reasonably efficient once I was moving at 8min/mile pace and faster. Now that I train more at easy pace and do lots of slow recovery runs my efficiency at 10min/mile pace has improved massively – easily 10%. Conversely, after a period of base building when I add back in tempo runs I find my efficiency at lactate threshold and faster is relatively poor. Once I’ve done a few weeks with tempo runs my efficiency at faster pace returns. Issues like this can totally ruin test data. The only way to factor stuff like this out is to train all the subjects the same way for months prior to the tests, to make sure they all wear the same footwear, or to rotate the footwear over different test runs. There lots of other factors that these studies are failing to account for. Given this we really should be looking critically at how valid it be to general case. I am surprised that in your own analysis you didn’t hold the studies more to account and qualify just much confidence should be applied to them. While it is true that greater deformation is associated with loss of recoil if the increased deformation is due to decreased stiffness, that is not what I am proposing. I simply propose increased deformation due to greater time on stance. Increased deformation leads to increased amount of stored elastic energy even in a viscoelastic material provided stiffness is not substantially reduced. Furthermore, I do not discount other factors (eg the tension in Soleus) making a contribution to the increased efficiency. With regard to your concern about Ogueta’s study, I do not place great reliance on that single study because there is large variation between subjects due in part to the various factors you mention (and hence substantial variation between studies). The between-subject variation was one of the main themes of my post. I base my conclusion on the overall evidence from all studies. Ogueta’s findings are consistent with the overall evidence though as I have noted several times previously, it is probable that between subject variation has inflated the effect observed at 13 km/hour. You are missing the same problem over again. Increasing the amount of energy absorbed and returned via elastic recoil of the hip flexors is only valuable if it’s done more efficiently than other muscle/tendons systems in the body. To explain the differences observed in the study the overall increase in efficiency the improvement in local efficiency has to be massive. It’s highly unlikely that the hip flexors are made more efficient by longer time on stance and longer extension. If they remain just as efficient with long time on stance as they do with short time on stance then overall efficiency won’t change, you are just moving where different bits of energy and stored and released. As for the Ogueta’s finding being consistent with other studies, I just can’t understand this statement, it would seem in this instance I have rather higher expectations w.r.t. being consistent. The studies we’ve cited between us all have different flaws and contradict each other if different areas. I can’t see any coherent finding that stands up to scrutiny. What there are a few intriguing titbits that suggest areas of further study. What we need are larger studies that factor out the issues that ruin the data so far collected. The hip flexors do work in swinging the leg forward. If the efficiency of this action is improved, that will decrease total energy costs irrespective of what happens elsewhere in the body. As I have said before, it might not be the only mechanism of increased efficiency, but it is potentially the most important because of the volume of muscle involved. I agree that bigger and better studies might add our understanding. However at this stage, the balance of evidence indicates that heel striking is more efficient at low and medium speeds for the majority of runners. But I would once again emphasize that the first lesson from the data is that there is substantial variability between individuals. In my blog post I emphasized that efficient running with minimal risk of injury requires the optimum balance between several different factors. For most runners, I suspect that the differences in efficiency to be achieved by adjusting foot-strike are likely to be small relative to the gains obtainable from a well-planned training program. However if a runner suffers recurrent injury despite a well-planned training program, he/she needs to determine the cause of their problem rather than relying on simple assertions about fore- foot or rear-foot landing. In view of the belief that heel striking was both dangerous and inefficient that was propagated widely in the running community despite virtually no evidence to support these claims, the fact that there have been several studies using various different methodologies that have found no significant evidence to support the assertion of lesser efficiency of heel striking, while several have found significant evidence to the contrary, is a useful clarification of the situation despite leaving room for debate about the details. Furthermore the fairly clear evidence that heel striking and fore foot striking each present risks of injury, but with differing risks at knee and ankle, is a useful clarification, despite the fact it leaves an injured runner with the task of identifying the nature of their problem. Furthermore, it emphasizes the need for all runners to develop adequate strength and resilience to protect themselves against injury. It should be noted that at low and medium speeds efficiency of oxygen use is probably not a major issue for aerobically fit runners. Gruber’s evidence regarding glucose utilization is potentially of much greater practical importance than the efficiency of oxygen utilization, at least for ultra-marathon runners. At this stage, I have not made placed major emphasis on the evidence regarding glucose utilization because it is based on a single study. I also think that in marathons and ultra-marathons, minimizing microscopic muscle damage is a high priority. I hope future investigators of the effects of differences in style address these potentially more important questions. Of particular interest in light of our recent discussions, the model predicts that at a pace of 14.2 Km.hr, heel striking is 6% more efficient than mid-foot striking. This prediction is remarkably similar to Ogueta’s observed data. Of course, one should not expect too much precision from calculations based on a model. Furthermore, Ogueta’s data confirms that there is substantial variation between individuals. Indeed from Ogueta’s data one can only confidently conclude that the benefit of heel striking lies in the range from about 3.5 % to 9.5% at paces around 14 km/hr. Your concerns about the inconsistency of Ogueta’s data are unfounded. Ironically, the reason we know with near certainty that the geneticist Gregor Mendel fiddled the fine details of his data that led to the law recessive inheritance is that his data was too consistent with his model. In light of the predictable variation in small samples, the probability of Mendel obtaining such consistent data was extremely small. In contrast, the degree of inconsistency in Ogueta’s data should be reassuring about the scientific rigour of the study. It remains crucial to recognise the range of variability between individuals. This leads not only to the expectation of variation in size of effects in small studies, but also warns against general recommendations based on individual experience. You really are desperate to cling on to highly dubious studies. The computer simulation study is so over simplified and contrived it really only demonstrates the use of their model, their own conclusions highlights how crude an approximation it is. Using this study as evidence of what actually happens in the real world really isn’t founded, not even the study authors believe this. The fact that the study is “similar” to the Ogueta’s study isn’t proof of anything. It’s not similar to the other studies we’ve discussed. Are we to believe the other studies are wrong? As for the anomalies in the Ogueta’s data being a good thing, proving that it’s real data and hence reliable. Sorry, it doesn’t prove anything, you can get noisy and odd data with mistakes and bias as you can get with natural variations between subjects. If even the variations are just down to natural variations rather study errors you are still left with the fact that these variations are large enough that it illustrates the study size was way too small, and given the study size was too small and had odd skewed results extrapolating this data to a wider group is not founded. You can’t conclude *anything* from the Ogueta data, it’s far too small a study size. They didn’t even test at 14km/hr yet you are confidently predicting a range of results. Something is wrong here, why are you so keen on clinging to this data there clearly has a whole series of flaws? Please, think deeply about mechanics – not arm waving but thinking about the muscles and tendons. We use all the same tendons and muscles, just use some of them slightly differently w.r.t timing and activation, but for all the major muscles at the core and upper legs the motion and activation is actually pretty similar. Where could this very large difference in efficiency be coming from? This is a complex enough topic I would suggest not attempting to answer it in the confines of a comment section. Also try out a test on yourself – try running at the paces suggest in both heel strike and mid-foot strike and see what happens to your heart rate. It should be easy to spot a 3.5 to 9.5%, for my own HR range the difference this entails a changing in HR for a given pace of around 2 to 7 bpm, or a change in pace for a fixed HR of 3.5 to 9.5%, either of which is pretty easy to spot. I have tried this test quite a few times recently and haven’t yet detected any difference in my heart rate going from heel strike to mid-foot. As a mid-foot striker it would have been great to see a benefit with mid-foot at the paces I’m running currently training at (average 8:30 to 10 min/mile pace) but I don’t – I have to accept the result, for me there seems to be undetectable differences in efficiency. I am an anomaly? Is my mid-foot gait somehow escaped the normally pitfalls of landing mid-foot?? Or is it the footwear I use designed well enough for a mid-foot strike that there isn’t a bias against mod-foot strike that more “traditional” high drop cushioned trainers exhibit. Is it that I’m training for ultra-marathons so have perfected my efficiency at slow speeds so my gait is highly tolerant to foot strike – i.e my ground contact times similar, over movement patterns similar? Understanding how I’m able to pull off this consistent efficiency trick might well illuminate the subject in useful ways, both from gaining a deeper understanding of the effect of different aspects to mechanics as well as providing a possible guide to others. I suspect one difference is that my ground contact times are probably pretty consistent between different foot strikes when running at low paces. This means that my main force generating muscles – in my upper leg and core are being used in a similar way. At these slow paces I also run with relatively relaxed lower legs and ankles – I deliberately avoid running with stiff lower legs as one would naturally utilize at faster paces. This will be quite a different movement pattern to what an elite half marathoner will likely utilize at what would be artificially low paces for them. Thanks for your continuing interest in this discussion. It is time to review the basis for your concerns. With regard to the Ogueta-Alday study, the point of statistical testing is to determine whether an observed effect is unlikely to have arisen by chance, taking account of the amount of random variation. From the effects reported by Ogueta-Alday we can conclude firstly, that the greater efficiency of the heel strikers at 11 and 13 Km/hour are very unlikely to have been chance findings. The effect observed at 15 Km per hour might have arisen by chance with a probability of 1 in 14. Thus, there is strong evidence of an effect at slow and medium speed and a moderate likelihood that there is a real effect at high speed but we cannot be confident of the effect at high speed. The probability that there is a real difference between the effects at different speeds is quite low. Perhaps I misled you by pointing out the lack of significant effect at higher speeds. The variability in the Ogueta-Alday data is such that there was not enough statistical power to determine whether or not the differences in the magnitude of the effect at different speeds were significant. There is no inconsistency in the fact that the effect was greatest at medium paces because the differences between the effects at different paces were not significant. The study was not designed to distinguish between the effects at different speeds. Although the benefit of heel striking reported by Ogueta-Alday is unlikely to have arisen by chance, there might be systematic effects due to study design that make it unreliable to draw general conclusions. That is why it is important to look for effects in various studies by different investigators in different groups of runners. It is also informative to examine the results of studies using different study designs (eg Gruber v Ogeuta-Alday) Of course studies with different design test for different effects, but nonetheless if there is an underlying real phenomenon, one might expect it to be revealed by different types of study. With regard to your concern that there is a conflict between Ogueta-Alday and Gruber, even though Gruber found the most significant effect at higher speed while Ogueta-Alday saw the greatest effect at intermediate speed, this difference in the speed where the effect was maximal effect is not significant. Thus your concern that there is conflict either within the Ogueta-Alday study or between Ogueta-Alday and Gruber is unfounded. These studies provide a moderately convincing body of evidence demonstrating that heel striking is more efficient at various different speeds and but no significant evidence of differences in the effect between different speeds. With regard to studies that have not found a significant benefit, none of these demonstrated the absence of an effect. Failing to identify evidence of an effect is not the same as demonstrating that the effect is absent, though it does place some limit on how big any real effect is likely to be. Unfortunately, Merni et al did not provide an estimate of such a limit. As for Miller’s modelling study, this adds a small amount of evidence in favour of a greater efficiency with heel-striking though the authors are rightly modest about the strength of this. It is possible to raise concern about the credibility of any one item of evidence. That is why it is necessary to look at multiple different types of evidence. The current situation is that several studies have found evidence of greater efficiency of heel striking, some of these studies provide statistically robust evidence. Nonetheless without evidence from different types of study it would be dangerous to generalise. Other studies such as Miller’s modelling, provide confirmatory evidence, but alone they would not amount to strong evidence. On the other hand, no studies have provided appreciable evidence that heel striking is less efficient. One of the Ogueta study flaws is that it tests athletes are abnormal paces relative to their race or likely training paces. You simply shouldn’t be extrapolating efficiency from paces that are out with the normal range that the athletes being tested would train or race at. You get most efficient at the paces you train and race at, and most critical speed for athletes to optimize their efficiency is their target race pace, which is outside what was tested – their race pace will be around 18km/hour. Another potential flaw could be how they measured the running economy. Using oxygen consumption as a measure has been show to be a poor proxy for actual running economy as the fuel mix used effects the oxygen consumption, with fat burning using more oxygen for a given amount of energy consumption. Running economy has also been shown to be effected by factors as simply as whether the athlete knows how long the test is being run for. Different athletes will respond to such stimulus in different ways. These factors effect the subjects of testing regards of footstrike, but it does mean you need to be very careful in making conclusions from small studies that poorly model real-world conditions. There are issues with both the Ogueta and Gruber study w.r.t footwear. Ogueta has running use their own shoes but restricted them to a weight range that seems to be quite outwith what I’d expect any one with a mid-foot strike to use regularly. In the Gruber study I believe they used a single shoe but it wasn’t a shoe designed for mid-foot strike and will likely bias all the results away from what you’d obtain with a shoe properly designed for mid-foot strike. Finally the dependencies between the Ogueta data itself should be enough to warning signs. A change in efficiency of 4% by just increasing speed by 2km/hour seems very odd. Why would I get 4% less efficient going 2km/hour faster, but they recovery my efficiency by going another 2km/hour faster? This very localised peak is very odd. It might be what they measured on the day, the data they may be correct for those particular runs, but to me it points to likely systemic problems in the study. The magnitude of the oddity is similar to the overall % difference between mid-foot and rear-foot. The Gruber study also said in the conclusion there was no efficiency differences between the mid-foot and rear-foot runners in their own preferred running form. You keep skipping over this. You also keep skipping over the fact that in my own testing I can’t find any positive or negative effects of changing foot-strike. DiMichele and Merni. The later study was the only one do in the real-world and suggested that mid-foot likely the more efficient. The study I earlier referenced you don’t seemed to have reviewed : “Four-week habituation to simulated barefoot running improves running economy when compared with shod running,” by authors J.P. Warne and G.D. Warrington shows an improvement in running economy with transitioning to using vibram five fingers after 4 weeks. This study suggests that one can improve economy by moving from a rear-foot to a mid-foot strike. I really can’t see how one can conclude overwhelming evidence for any conclusion when the studies don’t even come close to agreeing in absolute values or trends. I don’t see much point in trying to continue debate as I simply can’t grasp why you are so keen to make conclusions based on such flimsy and cherry picked evidence. I agree that there are many possible reasons why any single study might report an effect which does not generalise to ‘real world conditions’. That is why I emphasize the importance of looking for effects from studies of various different designs. Di Michele and Merni did not find a significant difference in efficiency between heel strike and non-heel strike. There are several studies which report changes in efficiency associated with change to minimalist shoes, but changing shoes raises quite different issues, and might or might not reflect the effect of changing foot-strike. Nonetheless, I do take account of these studies, in much the same manner as I take account of evidence that Pose is less efficient – this might be due to inefficiency of forefoot strike but might also reflect other aspects of Pose. I am aware that the studies by Ogueta-Alday and by Gruber have been subject to widespread disbelief because they run counter to many people’s expectations. Nonetheless, many of these objections appear to me to be clutching at straws by people whose expectations have not been confirmed by the evidence. However, each individual has to form their own judgement on the evidence. However, it is also important to recognise that efficiency of oxygen utilization is only one of several issues to consider. Risk of overt injury is usually more important, and in long races, the magnitude of microscopic damage to muscles is also likely to be important. I tend to employ a midfoot landing under most circumstances because I think it provides a reasonable compromise that minimizes both the jarring due to the rapid rise in ground reaction force with heel strike, and the stress on the Achilles and metatarsals with forefoot strike. Apologies for my grumpiness in previous post. It has since occurred to me that one can look to real-world results for hints about efficiencies of different gaits. If we look to the world of elite distance runners there are mix of rear-foot, mid-foot and forefoot runners. The current crop of world record holders of marathon downwards are mostly of the mid-foot or forefoot runners, but for 10k and above there are plenty of elite rear-foot runners that aren’t far behind. This observation doesn’t prove that rear-foot is slower or less efficient at the speeds these are elites are running at as there are plenty of other factors the affect performance. However, we can probably safely conclude at these speeds there won’t be a significant advantage either way efficiency wise, otherwise we wouldn’t see any of one class or other runner, the gait that is most efficient would totally dominate. Now elite distance runners that compete at the marathon and below are all running really fast, well outside that tested in most of the studies that have looked at running economy. So we can’t realistically use these race observations for what will work for lesser mortals that “plod” along at 15km/hour and below. It then occurred to me that there are elites that run this slowly – Ultramarathoners. Running 100 mile or for 24 hours reduces even the best ultra runners down to a pace of little over 10km/hour. If it were true that at these speeds heel striking was 5% more efficient then we would almost certainly see that heel strikers would dominant as a non heel striker would have to burn 5% more energy to keep up, such a big difference in fuel needs would be very hard to make up elsewhere. Is this what we see? If we look to the really stand out records set in the UK in the last few years two come to mind,Terry Conway’s Lakeland 100 and West Highland Way Race (WHWR) records set in 2012, and Paul Giblins’ astounding 2014 WHWR run of 15:07 that beat Terry’s record by 32 minutes. Terry and Paul’s records in the Lakeland 100 and WHWR are significantly faster than anyone else have run before. Both these runners run in minimal footwear and advocate minimalist running shoes and barefoot running form. While I haven’t had the opportunity to analyse their gait it’s very likely they have mid-foot strikes. Now there are plenty of other very fast ultra-marathoners who have set records that heel strike so I don’t believe there the case of Terry and Paul show that minimalism and mid-foot strike is more efficient. However, I don’t believe that you beat everyone else best attempts by such big margins and carry a 5% burden of an inefficient gait as well. They are awesome athletes but they aren’t super human (or quite that stupid as waste that much energy.) I believe their records are strong evidence that a mid-foot strike is not less efficient, even at paces of 10km/hour to 15km/hour. The difference to pick out here is that Terry and Paul train for ultra marathons, so their average training speed are likely much less than elite half marathoners. The amount of time and mileage they speed at these lower speeds is far more, so that they can perfect their running economy at these lower speeds much better. Another angle to consider. I am currently reading Steve Magness’ new book “Science of Running” and his postulates that runners with different mixes of muscles fibres tend to have different ground contact times and with it types of gait. He suggests that runners with more fast twitch fibres will tend towards mid-foot/fore-foot strike, while runners with more slow twitch fibres will tend toward heel strike. If this observation as an average holds true then differences in efficiency between runners with different strikes may be partly down to their muscle fibre composition as it is the running gait itself. Steve doesn’t make this last inference in his book, but it seems like a reasonable extension. However, this possible link between fibre type and likelihood of different foot strikes doesn’t preclude a massive overlap. Runners like Terry and Paul clearly are slow twitch fibre dominated, just like myself. For slow twitch fibre mid-foot strikers I believe the typical relationship between mid-foot strike having lower ground contract time and higher peak forces than heel striker may be absent. I also believe this relationship is typically broken by barefoot runners. Any full-proof model of running economy has fit all these different data points. For me what these different end points of the spectrum prove is that you can’t generalise limited studies based on small sets of participants. I accept that the observation that many elite marathon runners land on the midfoot or forefoot provides at least indirect evidence supporting the hypothesis that midfoot or forefoot might be more efficient at elite marathon pace. It should however be noted that some elites do heel strike – as illustrated by Peter Larson’s video of Meb. On balance I think the question of which footstrike is more efficient at elite marathon speed remains a very open question. Marathon and HM are the two events where efficient use of oxygen is crucial. In short events, ability to develop power is probably more important. Oxygen utilization is probably not the limiting factor in an ultra. As I have pointed out before, the debate about efficiency of oxygen utilization is of lesser importance at relatively low speeds. I think that efficient use of glucose is more important in an ultra. Even if you are well adapted to burning fat, some glucose must be consumed to refill the pool of Krebs cycle intermediates depleted by export of glutamine from muscle. So I will be interested to see if Gruber’s finding of increased efficiency of glucose utilization with heel-striking is confirmed. It should also be noted that use of minimalist shoes does not preclude heel-strike. Even if you have misgivings about Hatala’s observations, in Warne and Warrington’s study of adaptation to vibram Five Fingers, 20% did not make the transition to forefoot strike. Elite ultra runners are exceptional and might belong to the minority group, so direct evidence is required before concluding that they do not heel-strike. With regard to the quest for a ‘fool- proof’ model of running economy, I have repeatedly emphasized that the evidence indicates substantial individual differences so there is unlikely to be a model that fits all individuals. However the existing data favours greater efficiency with heel strike for the majority of runners at low and medium speeds. Information from larger studies would of course be desirable. However I think that at this stage it is very unlikely that evidence will emerge indicating greater efficiency of mid-foot or forefoot striking for the majority of runners at slow and medium paces. I consider that the main value of the existing evidence is that it indicates that the majority of runners are unlikely to achieve a worthwhile change in efficiency of oxygen utilization by changing from heel strike at low and medium speed, and might indeed suffer a penalty, despite the widespread belief in recent years, that such a benefit should be expected. I explicitly said that there is mixture of heel striker and mid-foot strikers in ultra running and that their will be an overlap in performance. My conjecture is that the strong performance of mid-foot runners in this category is a good indication that their is no dis-advantage to mid-foot runner for well adapted ultra-marathons. Actually running efficiency does not equate to directly oxygen utilization, nor will oxygen utilization be a factor in ultra-marathon performance – we don’t run with a limited amount of oxygen available. We run with a limited amount of glycogen, protein and other contributors to energy production, this means that real running economy (i.e. calories per mile) is crucial. Running economy as measured with litre of oxygen per km is completely irrelevant – and actually shows how poor a measure this is for extrapolating to actual running performance. All measures of running economy should be done in actual number of calories per unit distance rather than oxygen uptake, if a study uses the later it’s flawed right from the start. For an ultra-marathoner the key is glycogen calories per km required. A runner with a low glycogen calories per km will be utilizing more calories from fat and with it requiring more oxygen to support this. If we were to use Litre of oxygen per km it would appear that a such an ultra-runner is “less economical”, when actually when it comes to utilizing resources that have limited availability they are actually extremely efficient and far more economical. What I don’t quite understand is that we have all these data points from real-world runners that indicate that heel striking unlikely to be more efficient than mid-foot strike, yet you keep coming back to these clearly flawed studies as the best evidence we have. You keep references the one study that reports the most extreme advantage to heel striking and ignoring the others and other data points that don’t show this. Why this need for a single conclusion? Sometimes in science we need to dig deeper than simple conclusions and generalisations. It can be messy taking into account all the disparate data points but in the end you’ll be much closer to reality. I think we agree that there is great variability between individuals. The reason I continue to emphasize that there is very little evidence to indicate that heel striking is less efficient for the majority of runners at slow and medium speeds is simply because much of the debate of the past decade has focused on the expectation that efficiency would be improved by changing from heel strike. That view is simply not supported by direct evidence. Furthermore, I do not consider you have provided any substantial reasons to regard Ogueta-Alday or Gruber’s studies as seriously flawed, so at the moment I consider that the balance of the evidence does favour heel strike for the majority. This is consistent with the observation that the majority of runners heel-strike at low and medium speeds, though you might reasonably argue that padded shoes have encouraged this. However as I think we both agree, efficiency of oxygen utilization is not the only thing that matters for distance running performance. I myself favour mid-foot under most circumstances. I have not once argued that heel striking is less efficient at any speed. However, what I have argued that the evidence that heel striking is more efficient is not reliable, and there are counter points that suggest that bio-mechanics of mid-foot is probably not less efficient even at slow paces. Evidence for the later is my own tests, and the observation that top, record breaking ultra-marathoners include plenty of runners that use a mid-foot strike. If a 5-9% dis-advantage for mid-foot or fore-foot strike were generally true these counter points simply wouldn’t exist. I have pointed a wide range of flaws and inconsistencies with the studies that you have cited, sample size, from problems with footwear through to unrepresentative paces used through to errors in using a discredited measure of running economy. There are enough discrepancies and weaknesses in the studies to know that you can’t extrapolate the data. If you do it doesn’t fit with the other evidence that we say such as with performance of ultra-marathoners and other elite distance runners. If the studies were solid they would fit the extrapolation to real-world. A flaw that we haven’t discussed is the gross simplification of gait down to just foot strike. No two heel or mid-foot/forefoot strikers are alike. Elite runners that run at a very slow pace for them will have quite different mechanics to a hobby runner running at the same speed but nearer to their own maximum speed. The classic gait we see with heel strikers in the general population includes over striding and excessive dorsa-flexion that just isn’t very rarely present in elite heel strikers. All these differences further hammer home how you can’t make simple extrapolations and conclusion from these limited studies. I do not think our positions are too far apart on many of the issues. Nonetheless, I do think that the debate regarding style has been greatly clarified by the finding that there is no appreciable direct evidence that heel strike is less efficient, while the balance of direct evidence actually points in the opposite direction. This is an important clarification because it is contrary to the strong expectation of many people based on indirect arguments similar to those you advance, such as the belief that heel striking is associated with undesirable features such as over-striding. The biomechanical issues are complex. Some braking is inevitable, and optimal efficiency requires a balance of the costs of braking, elevation and limb repositioning. Although you have every right to be sceptical of the model employed by Miller, it is nonetheless a model that gives quite accurate prediction of the energy costs of running, and it actually predicts that heel striking is more efficient in the speed range of interest. Your concern that the studies have not allowed for variability in style is not valid. The studies by Ogueta-Alday and Gruber did have adequate power to detect significant effects of interest despite variance due to individual differences within the population sampled. If a study were to be designed to examine a group of runners with more homogeneous style one might expect the variance would be smaller and the power to detect effects of interest would be greater, but the findings would be less generalizable. Defining the population to be sampled is a key feature of study design. In general one wants to avoid extreme variability, but on the other hand very strict limitation of the included population reduces generalizability. You are unduly preoccupied with the magnitude of the effect observed by Ogueta-Alday. Even at 13 km/hour, where they observed an average benefit of 9.3% for heel-striking, the 95% confidence limits on the estimate of the population average range from around 5% to 13%, while the confidence limits on the population average at 11 Km/hr range from about 1.5% to almost 10% . It is noteworthy that several different sources of information do lead to an estimate of around 5%. On balance I consider the overall magnitude of the ‘true’ average effect in this population in the range 11-13Km/hr is unlikely to be greater than 5%, and might even be less. The degree of uncertainty does not invalidate Ogueta’s data, but merely reflects the consequences of variation between individuals and between studies . We have previously discussed many of your other concerns. I do not find any of your objections compelling but agree that issues can be raised about the design of virtually any study of human physiology. It is therefore necessary to examine evidence from multiple sources. > I do not think our positions are too far apart on many of the issues. I believe there are miles apart. I believe the weight you are putting in the studies are unwarranted. None of these studies directly measured actual running economy. The fact is there is no available means for directly measuring the energy cost of running. Measuring oxygen consumption is only a direct measurement of oxygen consumption, at best you can estimate possible energy cost of running if your know the exchange ratio. If these studies don’t even bother making this step then they *aren’t* measuring running economy at all, just oxygen consumption. At best oxygen consumption is crude proxy for running economy. Measuring oxygen consumption on treadmill takes you another step away from actual running economy in the real-world. Using a small sample of a specific type of runners further limits the validity for anything other that particular set of runners. You can’t extrapolate it to a totally different set of runners which train and race at very different speeds to those elite. I am perplexed how you can look at these studies an see how limited they are, and how undermined by the crude form of measurement used, but still boldly predict very significant efficiencies differences. However, in the real-world we just don’t see these differences. In my own tests I can’t tease out any improvement in heel-striking. Also ultra-runners I find it totally implausible that the competitive world of elite ultra-marathoners would not show a significant bias towards heel striking if the scale of efficiencies differences were at all real. You simply can’t pay a penalty to 5-9% and still make up for it somehow but being that much fitter elsewhere. Finally, I haven’t seen a single plausible model for how heel-striking would be more efficient. If it really were true that there was 5-9% benefit from heel striking at modest paces there please put your money where you typing is… run a half marathon or 10k first with mid-foot then do the same route with a heel strike. If there were a significant different in efficiency for sure you’ll see it. I think you are eager to emphasize the differences. I hope I have made it clear that I have been referring to efficiency of oxygen use. I do not regard this as the only aspect of metabolic cost that matters in distance running. In particular, in both middle distance running and ultra-marathons, I think efficiency of oxygen utilization is far from the most important requirement for successful performance. Even in the marathon, I believe that any difference in efficiency of oxygen usage between heel-strike and mid-foot strike is probably less important than differences in tissue damage. Furthermore, I do not believe that heel striking is 5-9% more efficient than midfoot. First of all, the studies that we have been discussing compare heel-strike with non-heel strike (ie mid-foot pooled with forefoot). I think it is probable that the greatest inefficiency is with forefoot, though this is speculation. I would not advocate running a marathon or HM with forefoot strike. Secondly, as I have pointed out before, on the basis of wide confidence limits (i.e. large uncertainty) on the estimates of the mean effects in the published studies , and taking account of all the results from diverse studies including the studies that found no difference, I would be surprised if the average difference between heel strike and non-heel strike was any larger than 5% and it might well be even less. The difference between heel strike and mid-foot strike is likely to be even less. However the point that I wished to emphasize in my blog post is that contrary to the popular belief during the past decade that heel-striking is less efficient than non-heel-striking, there is no appreciable direct evidence for this. On the contrary, the balance of evidence is that heel-strike is actually more efficient. I believe that this conclusion has an important practical implication. The current evidence does not provide direct support for changing from heel-strike for the sake of improving efficiency. If we disagree on this point, then yes, we do have an important disagreement. However, perhaps we do agree on the importance of the respiratory exchange ratio. This issue is especially important during ultramarathons. In fact Gruber did measure both oxygen utilization and CO2 production. She did not explicitly report the values of RER, but perhaps more importantly, she reported both efficiency of oxygen utilization and efficiency of glucose utilization. She observed that heel-striking was associated with greater efficiency of glucose utilization. This was more marked than the difference in oxygen utilization Until her finding of greater efficiency of glucose use is confirmed we cannot draw any strong conclusions. However, if her findings reflect a greater proportional utilization of fats (and hence lower RER) this would potentially be of importance in ultramarathons. Burning fat requires more oxygen for a given energy output, but conserves glucose. As discussed above, efficiency of oxygen use is relatively unimportant in an ultramarathon. Replenishing oxygen supply is no problem. However, one cannot run on fat alone, so fuel supply is a bigger issue. If Gruber is right about increased efficiency of glucose utilization, one might expect that many successful ultramarathoners would be heel strikers. Dean Karnazes appears to be an example. Do you know of any evidence regarding foot strike in successful ultra-marathoners (apart from assumptions based on shoe choice, which is associated with several confounding issues)? Post script (22 March): I note that Pete Larson reported a study of runners in the 2012 Western States Ultramarathon that reported that 80-90% were heel-strikers, but there was no discernible relationship with performance. He notes that shoes are a confounding factor in interpreting this. His final conclusion is that least from a performance standpoint it doesn’t much matter how your foot contacts the ground. I am inclined to agree with this, as a general rule. Nonetheless, I think that for each individual, the foot-strike that causes the least muscle damage is likely to produce the best performance over distances of marathon length and upwards. But when it comes to group averages, I think that whatever differences there might be in efficiency of either oxygen use and/or glucose use, these effects are obscured by the many other factors that determine performance. One problem with most of these efficiencies studies is that they use oxygen consumption per unit distance, and as you say oxygen intake isn’t a determinant of performance. It’s a bit like measuring VO2Max, it again poorly correlates to performance. In the case of Running Economy, oxygen consumption doesn’t even map to actual calories burnt so it’s not even a good proxy. I believe like VO2Max using of oxygen consumption for Running Economy is down to it being a relative easy quantity to measure rather than it being a good measure of real efficiency – this is really just lazy and leads to mis-leading scientific study. What is critical to performance is actual calories used per unit distance and calories from marathoners and above it glycogen used per unit distance will become a critical factor. I suspect that glycogen consumption rate correlates well with the peak loads on stance, and peak loads are controlled by the balance of time on stance vs time in air. Typically in shod studies of mid-foot and forefoot strikers we see lower time on stance and higher peak loads with it. However, this is likely a correlation, not a causation. If we look at barefoot mid-foot and forefoot runners they don’t exhibit the same short time on stance vs time in air, instead actually minimize their time in air far more than their time on stance – they change their gait to one that minimizes vertical forces. On the topic of correlation between shod mid-foot and forefoot strikers utilizing less time on stance vs time in air and producing higher peak forces, this may be an indication of different fibre type present/being utilized. Those which tend more towards fast twitch fibres would be inclined to run with a shorter time on stance vs time in air, and with this preference for short time on stance may require a mid-foot or forefoot strike to enable it to be done comfortably. These are observation that need to be investigated further, as I believe we can learn so much more about gait once we get beyond the small and over simplified studies on running economy. I absolutely believe there isn’t a black and white polarization, but I huge overlap between different aspects of gait. One only needs to compare Usain Bolt to Barefoot Bob to know that their is huge variation in running form even with a similar footstrike. Note the “This is slightly less than previous observed in a Marathon”. The difference at mile 10.2 is ~8% less heel strikers than what Pete Larson observers in his study, which is significant. This also means there was ~66% more non heel strikers than in the marathon study at this point in the race, when looked at this perspective it’s actually quite a big difference. The later distances dramatically cut the number of non heel strikers, which suggest fatigue plays a big part in how runners adapt their strike to cope. The fact that no correlation between footstrike and performance was found supports my previous assertion that I don’t believe there is an real-world difference w.r.t running economy of heel striker vs non heel striking for ultra-marathoners. Real-world data like this dispels the notion that heel strikers have better running economy than non heel strikers. While this data shows that it’s perfect efficient to use a non heel strike when running at slow paces and doesn’t happen performance, the observation of the high CK levels in non heel strikers is interesting. It obviously wasn’t significant enough to hamper performance to skew the results in favour of heel striking, but it’s still something to take note. The explanation for this again is likely to be more than just a simple issue of actual gait. In the ultra-marathoner world the idea of running with mid-foot strike has taken hold quite significantly over the past 5 years. A good proportion of the top ultra-runners are known advocates of minimalism and mid-foot/barefoot style gait. I believe there are more minimalist and mid-foot runners in ultra-marathon community than every day marathoners, the West States data bare this out. Many of these runners like myself will have migrated from a heel strike to mid-foot strke, and during this transition period running with this new gait will almost certainly result in more soft and bone tissue damage. Once full adaptation is complete this tissue damage will be greatly reduced, and I’d expect to return to normal levels prior to the gait change. This observation is hinted at by the fact that a good proportion of the non heel strikers West States runners moved to heel strike by the half way point suggests that full adaptation hadn’t been obtained yet – they simply weren’t able to maintain the same gait without overt fatigue yet. I’m now a few years into moving into mid-foot strike and unlike the early days don’t find myself fatigued by landing mid-foot near the end of race – instead I’m now just generally fatigued, the tissue that is more stressed by a non heel strike have strengthened up. I believe it takes several years to build this strength up though. We agree that efficiency of oxygen use is not a strong determinant of performance except in half marathon and perhaps also marathon. I consider efficiency of glucose utilization is of moderate importance in marathon and probably even more important in ultra-marathons. The only investigator among those we have been discussing who measured glucose efficiency was Gruber and she found a significantly greater efficiency with heel strike. As I have stated several times, I consider that in long races minimisation of muscle damage is one of the most important factors. In general I believe that is probably best achieved with mid-foot, but for a person who is not a natural mid-foot runner, it might take several years to become well adapted to this. So I think the advantage of changing from heel-strike to mid foot are small and perhaps non-existent, provided the heel strike is not associated with excessive braking force or jarring of the leg and spine. As for forefoot strike, I would not recommend this in any race longer than 10K. I still think that the evidence has substantially clarified the debate regarding foot strike that has occurred over the past decade. The conclusion for the long distance runner is that forefoot strike has little to recommend it. There is no appreciable evidence that is efficient for either oxygen or glucose utilization. It is likely to be harmful for calf muscles, Achilles, plantar fascia and metatarsals, though it might protect knees. The differences between mid-foot and heel strike are small. Heel strike might offer the advantage of greater efficiency of glucose utilization. However,it is probably advisable to avoid a heavy heel strike that causes excessive braking and jarring. I agree that minimizing muscle damage is a crucial factor in running ultra-marathon, and to lesser extent marathons. As a ultra runner with a mid-foot strike I’d like to believe that it protects me from overall muscle damage. However, the Western State’s data on CK levels suggests the opposite. This might be explained by non heel strikers recently adopting a non heel strike so not yet fully adapted, but there is no way to know how much of factor this might have been. Personally I think the overall variation between gaits of different runners easily dominates just one factor such as foot-strike. It’s quite possible for a heel striker to run with a vGRF similar to barefoot runner, and for these two to be more similar to each other than a heel or forefoot striking sprinter or elite middle distance runner. Given this I would strongly caution reading into studies like Gruber too much. Again I’d suggest one is careful not read correlation in this particular dataset with causation. If runners with more fast twitch fibres more often choose not to heel strike the averages will be heavily skewed against non heel strikers when it comes to running economy and especially glycogen utilization. Such population bias is just a correlation, non heel striking isn’t actually the cause of the difference. This is just speculation on my part, but I’m not only one thinking this – Steve Magness suggests the link between foot strike and fibre type is his book. If you move away from elite distance runners, or general runners, and look at ultra-runners who will almost certainly be blessed with a dominance of slow twitch fibres. In this population there is mix of foot-strikes, but according to the Western States data no relationship with performance. This data strongly suggests that efficiency of glycogen utilization is similar. Given the non heel strikers had on average greater muscle damage markers it would suggest that they was no penalty beyond this. For sure you can’t have greater muscle damage and lower efficiency and still be just as fast. If the muscle damage was in part down to incomplete adaptation to a new foot-strike then it would be logical to assume that after a few more years with that foot-strike the muscle damage penalty will be greatly diminished or gone complete, and one would also expect their efficiency to improve as the motor programming fine tunes to different strike. If the non heel strikers have less damage than they did, and are then more efficient than they were, then… it would suggest they would be faster… and if they were just as fast as non heel strikers originally then once adapted it would logical that would then be faster on average. In Scotland we have quite a few ultra course records held by non heel strikers. I don’t have any stats, but I’m pretty sure it’s now greater than 12% that might be just suggested from % of running population. I as far as I can see what you say is broadly consistent with the summary in the final paragraph of my previous comment. Overall, the differences between mid-foot and heel strike are small, while forefoot has little to recommend it. It is also noteworthy that Mark Kasmer reported that minimalist shoes were associated with better performance in a 50Km trail race in which muscle damage would be expected to be less than in either a road race or a longer ultra. Overall, the evidence suggests that provided serious muscle damage can be avoided, minimalist shoes are preferable, but the advantage is more likely due to the lower weight than to foot strike pattern. The optimum shoe appears to be a crucial factor for performance in ultras. Heel striking might confer an advantage that compensates for the penalty of greater shoe weight. To clarify this issue we need data on performance, foot strike, muscle damage, and shoe weight. Multiple regression would allow us to estimate the contributions of foot-strike, shoe weight and muscle damage to performance, provided the effects of these variables on performance are approximately linear. Your suggestion that the shoe type may being influencing the amount of muscle damage is reasonable. At this stage I don’t think it’s possible to tease apart whether it’s the gait differences that people have when using different footwear, or whether those running using more minimal footwear haven’t yet fully adapted to them, or whether it’s simply that less cushioning results in more muscle damage. The study that suggests a link between wearing more minimal shoes and achieve better performance is an interesting one. This might be more down to correlation than causation. It could be that faster runners seek to optimize performance more than comfort so choose lighter and more minimal shoes. This correlation might also result in those with more minimal shoes showing greater muscle damage because they are running faster. Your suggestions for more analysis are all tantalizing… but alas I fear we’ll be relegated to just thought experiments for a good deal longer. Which kinda leaves us a bit of limbo of what to make of it all. In the end I guess we’ll just need to wear what we enjoy wearing the most, and what works best for us. If we get these factors right then we’ll probably race better regardless of what shop type or gait we choose.